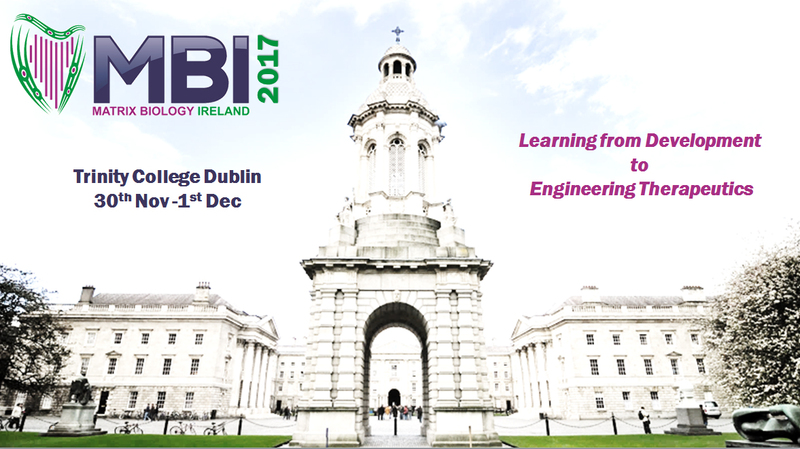 "Learning from Development to Engineering Therapeutics"
The Monaghan Lab at the Trinity Centre for Bioengineering, Trinity College Dublin, the University of Dublin hosted the 4th Annual MBI meeting from the 30th November -1st December, 2017. The theme of the 2017 meeting was ‘Learning from Development to Engineering Therapeutics’ with the aim to create a significant format for young researchers to showcase their research and actively network both nationally and internationally. The meeting was opened by the local organising chair; Asst. Prof. Michael Monaghan who welcomed the national and international delegates. The 4th Annual meeting deviated from a typical format, with the introduction of a Young Investigator Rapid Fire Round to kick off proceedings. This session was chaired by Prof. Liliana Schaefer (Goethe University, Frankfurt, and President of ISMB) and Prof. Abhay Pandit (National University of Ireland, Galway), who put 11 young investigators through their paces in delivering a concise three-minute presentation followed by 1-2 questions. Following the Young Investigator Rapid Fire Session, the main sessions of the meetings commenced with the inclusion of the invited guest speakers. All sessions were composed of both invited guest speakers and talks selected from submitted abstracts- the majority being from Young Investigators. Additionally, the session chair panel consisted an established PI with a Young Investigator as co-chair. Prof. Charles Little (University of Kansas, USA) delivered the first invited lecture of the meeting; he delivered a talk demonstrating ECM motion during early amniote embryogenesis. The following talks proceeded to focus on the role of ECM in its purest forms including Prof. Liliana Schaefer and Prof. John Couchman (University of Copenhagen, and Chair of BSMB). The afternoon session of the first day introduced us to how cell-matrix interactions control circadian clocks in breast tissue with Prof. Charles Streuli (Wellcome Trust Centre for Cell-Matrix Research, Manchester), leading onto tumour microenvironments and the induction of immunomodulatory functions of stromal cells by Dr. Aideen Ryan (National University of Ireland, Galway). Prof. George Bou-Gharios (University of Liverpool, UK and BSMB Council) led the last session of the day with an intriguing discussion on matrix gene enhancers to target fibroblasts and chondrocytes in connective tissue diseases, followed up by Dr. Karen English (National University of Ireland, Maynooth) who discussed chronic inflammatory lung diseases and the use of mesenchymal stromal cells as a therapy. The day ended with a welcome wine and cheese poster reception at the Trinity Centre for Bioengineering. The second day of the meeting focussed primarily on the topics of imaging, ECM in cardiovascular disease and concluding with harnessing ECM as bioengineered therapeutics. Prof. Peter Friedl (Radboud University Nijmegen Medical Centre, The Netherlands) presented detailed investigations using multiphoton microscopy and introduced many of the delegates to the concept of ‘cell jamming’, which was followed by Prof. Caitriona Lally (Trinity College Dublin) demonstrating conclusive high-resolution diffusion MRI in the non-destructive characterisation of arterial structure. The second session of the day was cardiac-ECM-centric with Prof. Adam Engler (University of California San Diego, USA) showcasing his research group’s cardiovascular ‘diseases-in-a-dish’ with engineered niche. Dr. John Baugh (University College Dublin) delivered a thorough talk on epigenetic modifiers as a treatment of cardiac fibrosis and heart failure, while Prof. Garry Duffy (National University of Ireland, Galway) detailed the development and implementation of advanced materials for cardiac regeneration (Medtronic Sponsored Lecture). The final session of the meeting was a showcase of ECM bioengineering therapies in the Irish Scientific Community. Dr. Tanya Levingstone (Dublin City University, Ireland) led this session with a detailed history of developing directed osteogenesis and chondrogenesis in a multi-layered osteochondral scaffold; all the way to its application in treating osteochondritis in a 16-month old thoroughbred filly. The day ended with a closing address from Dr. Michael Monaghan (Trinity College Dublin) who introduced Dr. Olga Piskareva and Dr Ronaldo Do Amaral (both Royal College of Surgeons in Ireland) as newly elected MBI Council Members. Prizes were also presented to the top student presentation in each category which were evaluated by an independent judging Panel. The prizes were awarded to: Sigita Malijauskaite (University of Limerick) for Best Poster presentation, Juhi Samal (National University of Ireland, Galway) for best Rapid Fire Presentation and Olwyn Mahon (Trinity College Dublin) for Best Podium Presentation. The MBI 2017 organising committee would like to acknowledge the support of the following sponsors and exhibitors: Medtronic, MERCK, Lennox, Biocolor, Mason Technology, Sarstedt and Zwick/Roell Testing Systems. Dibyangana Bhattacharyya (NUI Galway), Stefan Scheurer (Trinity College Dublin) and Julia Fernandez-Perez (Trinity College Dublin) were the winners of the exhibitor booth passport check-in scheme.